This post has been contributed by Greg Hart, Urban Wildlife Programs Coordinator with the Stanley Park Ecology Society. 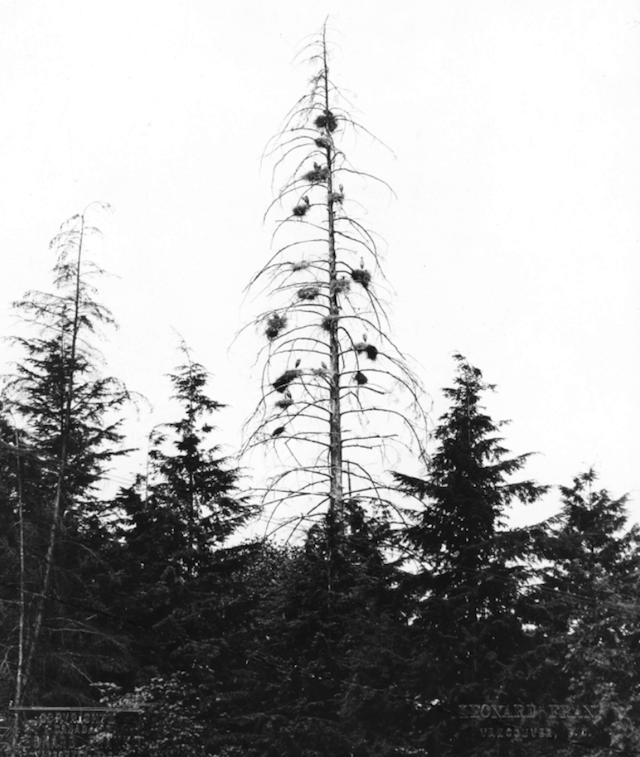 For almost 100 years, herons have called Stanley Park “home”. The earliest known record of these magnificent birds dates back to a 1921 photo by Leonard Frank of a colony near Brockton Point. Even back then, the great blue herons captivated onlookers and Park users. Nobody knows exactly when the herons will return—or if this is the year the herons abandon the colony and change location. With an unseasonably cold winter filled with ice and snow, the Pacific great blue herons did not return to their nests at all in February. A few birds landed in the trees briefly last week. However, they quickly disappeared after a couple short hours. Those were the only glimpses of the birds we saw near their colony by the tennis courts in Stanley Park. Finally, on March 9, several birds landed in the trees. A day later saw more than a dozen Pacific great blue herons claiming nests in the trees. This is an extremely promising sign that they will use this location to nest again this year, just as they have since 2001. There is even one pair of birds engaging in different courtship behaviours. 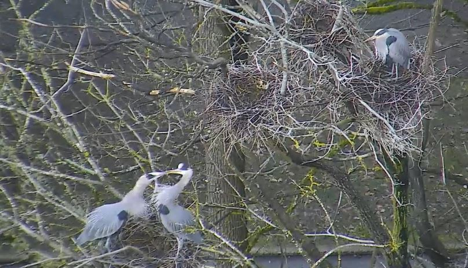 You can watch a video clip of their “bill duel” shot from the Vancouver Park Board’s Heron Cam. The camera, installed on the balcony of a nearby apartment building, provides a bird’s eye view of all the action of North America’s largest urban Pacific great blue heron colony. A Stanley Park heron pair engages in a “bill duel”. Visit the City of Vancouver heron cam website for more information on the colony and for an explanation of the heron behaviours you may see there. Stanley Park Ecology Society can also provide you with a monthly email update on all the heron action (subscribe on the website). And join in the conversation by tweeting your observations and any questions with #HeronWatch . The Pacific great blue heron is a species at risk due to habitat loss and population decline. Stanley Park Ecology Society gathers data on the number of birds, nests, eggs, and chicks to determine the colony’s productivity and population size. We also install and maintain metal bands on the trees to protect the herons from predators like raccoons. You can help support these efforts by adopting a heron nest for the 2017 season. Even though the exact location of the nests will inevitably change, we hope that—with your help—these wonderful herons will continue to call Stanley Park home for another 100 years. Follow SPES on Twitter and Facebook for more information. This post has been contributed by Greg Hart, Urban Wildlife Programs Coordinator with SPES. I live next to the Heron colony and i am concerned that not many fledglings will survive this year because of the constant attacks from the bald Eagles. Last year the eagles were not too successful in feeding on the young Herons but this year, i notice, that several times the eagle is very successful in getting a young one to feed his family. I understand that it is nature and that predators must feed their young ones as well, but i feel that the colony is in danger this year. I don’t think that many fledglings will survive the incessant attacks of the eagles. i would really like to hear your comments about this. Thanks.